Ok, let's extend the grid concept for email targeting. 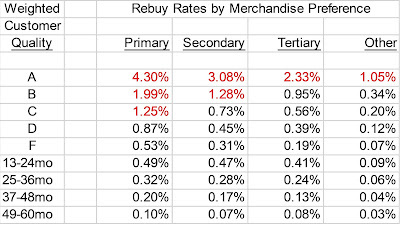 Let's say you have a customer who has a Primary Category of 2 and a Secondary Category of 12, based on Weighted Historical spend. What is the probability of this customer buying from other categories in the next month? Clearly Categories 2/12 are important ... and there's a bump in Category 19 as well. But clearly, the Primary / Secondary framework matters ... it matters a lot. Monday = Key Brand Message (same message sent to everybody). Tuesday = Feature New Merchandise from the Primary Category. Wednesday = Feature New Merchandise from the Secondary Category. Thursday = Feature New Merchandise from the Tertiary Category. Friday = Key Winners From Across The Brand (same message sent to everybody). Using this framework, you expose every single email subscriber to an outstanding cadence. Each customer gets to see a key brand message. Each customer gets to see what your winners are. And each customer gets to see new merchandise from their Primary / Secondary / Tertiary categories. We'll extend the concept tomorrow. P.S. : Yes, I get it ... some of you dynamically load products in a personalized manner into your campaigns, while others just chug out 40% off plus free shipping messages with a man and woman looking warmly at the image of a t-shirt. Y'all do something different. I'm encouraging you to partner with somebody, in-house or outside, to target appropriate merchandise to the right customer. People have been doing this for twenty years. Pick up all the dollars lying there on the floor, ok?! Take a look at this monster! Go ahead, click on it ... I'll wait for you. This table is for the best customers ... a grade of "A". Each row represents a preferred Weighted Category ... if a customer spent more weighted historical money on Category 11, then you read across the row for Category 11 ... the numbers are the probability of a customer buying from any category in the next month. Read across the row for Category 11. Tell me what you see?? I'll simplify it for you. No customer is more likely (by a long shot) to buy from Category 11 next month than customers who have spent the most weighted historical dollars in Category 11. For these customers, their preferred future categories are Category 11 and Category 12. What should your email campaigns focus on, for this customer? Now go do something about it! This targeting methodology makes it really easy to do the right thing for a customer. If the customer prefers Category 11, give the customer what the customer asks for! Feature new products from that Category, and heck, add some of Category 12 for the customer as well. Hillstrom's Targeting pricing can be found here. Ok, let's look at a practical example of Primary / Secondary / Tertiary categorization of merchandise categories. 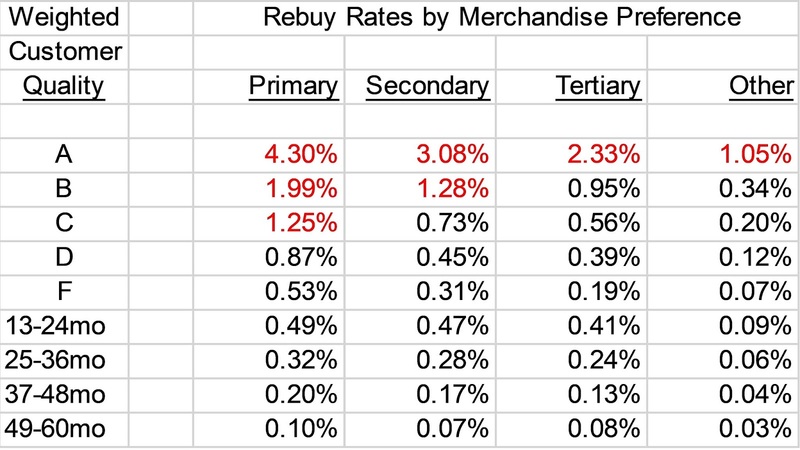 In this case, we look at next-month repurchase rates based on Weighted Customer Quality and Primary / Secondary / Tertiary for a specific merchandise category (say Home merchandise). We use historical customer data to segment customers based on quality and if the customer's spend on Home merchandise yielded Home as a Primary / Secondary / Tertiary favorite, or none of those. Ready? Here's the targeting table. The targeting table illustrates the probability of a customer buying from Home in the next month, based on Weighted Customer Quality and Primary / Secondary / Tertiary preference for Home merchandise. The cells that are red are cells that, if you were to target Home merchandise in an email campaign, you'd ultimately target. You'd target any 12-month "A" customer, period. You'd target 12-month "B" customers who like Home as a Primary or Secondary preference. You'd target 12-month "C" customers who like Home as a Primary preference. You have what you need to execute an Email program that features Home merchandise. Those are the cells you need to target, if you want outstanding response. If you want to add segments? Add "B" customers with Tertiary preference. Add "C" customers with Secondary / Tertiary preference. Add "D" customers with Primary preference. You've just added a component to your Optimization Program ... good for you!! Maybe you're not joining me today (unlikely), and while I'm devastated by that fact, I thought you'd still like to see the presentation I'm giving while you toil in your office. So click here and enjoy! This week I've shared with you my "Weighted Quality" process. It's an important process when considering who to target, as demonstrated yesterday. I use the same weighting process to create six additional variables. These variables are pure gold!! Primary / Secondary / Tertiary represent the categories or channels that the customer historically spent the most weighted dollars. $100 in Mens 0-12 Months Ago. $100 in Womens 13-24 Months Ago. $200 in Kids 25-36 Months Ago. We now have Primary / Secondary / Tertiary categories. Tomorrow, I'll show you just how valuable Primary / Secondary / Tertiary categories are to a targeting process!